When you encounter an unfamiliar word, how quickly do you move to check your lexicon? If you're like us, you take action immediately, rifling through your dictionary or, preferably, running to your favorite online word bank to define the alien phrase before it slips your mind. Looking up a new word as soon as possible after you hear it greatly increases the odds of retention, making celerity a valuable trait for language learners! Celerity defines rapidness in motion or activity. Anything that happens with celerity goes extremely quickly; think of the speed at which a text message travels or the swift passing of a warm, breezy Spring day. Something with celerity moves with eagerness and with little hesitation; though this can be helpful in many situations - after all, dilatory text messages wouldn't do much good - the word itself doesn't necessarily imply any sense of benefit or detriment. For example, while mowing your lawn with celerity would get you finished sooner than normal, it might not be worth the corners of grass you overlooked in the process. Example: The crowd at the finish line gushed over the marathon winner's celerity. Example: The celerity of her response made me wonder whether her answer was sincere. One of the great things about studying etymology is that it can reveal connections that help us to better understand words. For instance, celerity - a relatively uncommon word - developed from the Latin adjective celer, which means "rapid" or "quick." Celer also forms the base of a much more familiar English word - accelerate, which you likely know means "to increase in speed." 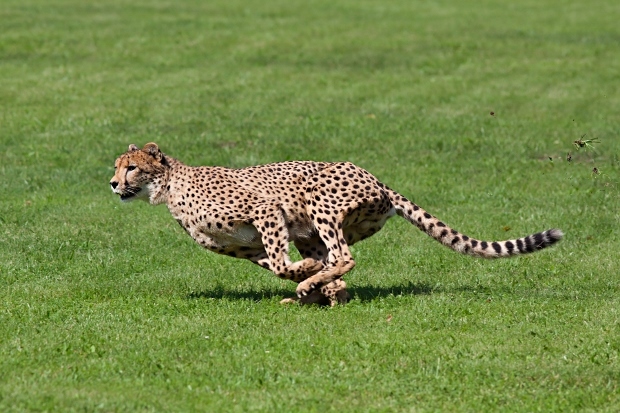 Understanding the meaning of that one Latin root provides a link between the two English words, perhaps giving you a hint that celerity has something to do with speed even before you look up its definition (connections like these make us lexicographers feel all warm and fuzzy inside!). In Latin, celer would give rise to the noun celeritas, which roughly translates to "speed" or "the state of being fast." In later centuries, the property of celeritas would be used by European physicists as a variable to represent velocity (denoted by the lowercase letter c). Today, celeritas as c is used in science to refer specifically to the speed of light, as in e=mc2 (although, interestingly, the first physicists to use c in this way meant it to stand for "constant"). As for celerity, it would make a pit stop in Old French (celeritee) before dashing into English with its modern spelling and meaning sometime around the end of the fifteenth century. The phantoms, for so they then seemed, were flitting on the other side of the deck, and, with a noiseless celerity, were casting loose the tackles and bands of the boat which swung there. Here, Melville uses the phrase "noiseless celerity" to describe the silent, practiced speed with which the deckhands dislodge a spare side-boat. Celerity is tardiness when ardent desire urges. Here, Syrus pithily says that even celerity is not quick enough to satisfy a strong yearning. Bring out the linguist in you! What is your own interpretation of celerity. Did you use celerity in a game? Provide an example sentence or a literary quote.